How Do Body Fat Scales Work & Are They Accurate? Although a scale is a useful tool in measuring weight loss, it is limited to evaluating only one component: weight. When it comes to health risks related to being overweight, fat is the culprit. Measuring body fat percentage is a better indicator of how well your diet and exercise program is working. Determining your body fat content once required a visit to a facility with dual energy X-ray absorptiometry or hydrostatic weighing. Another option was caliper measurements at the local gym or bioelectrical impedance analysis found at doctors' offices. 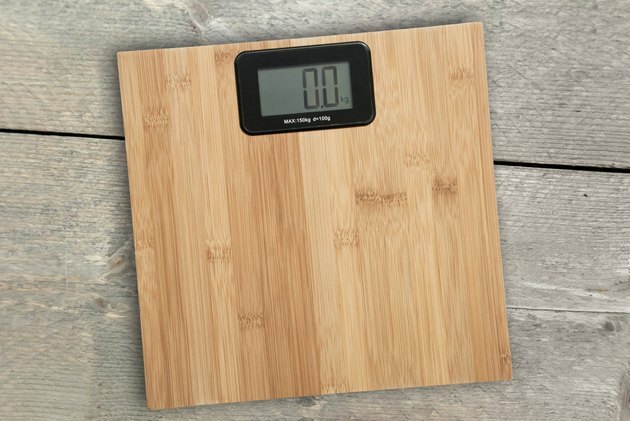 Body fat measurement via home scales now allows you to check your fat conveniently and for less money. Carrying too much fat weight is known to increase your risk of heart disease, hypertension, diabetes and some forms of cancer. For some people, it is obvious from their appearance they have too much fat; however, it is possible for a person to look thin, and yet have too much fat. Fat may "hide" in many places in the body, and as people age, fat often replaces muscle if they aren't exercising regularly. Body fat percentage is the amount of fat in your body compared to all the other components of the body; it varies based on gender and age. For women, any body fat percentage over 25 percent is considered too high. Men should avoid having more than 20 percent body fat. For both women and men, the younger you are, the lower your body fat percentage should be. A "Consumer Reports" study of body fat scales supports what many health and fitness experts say: that these scales are not as accurate as other body fat measurement methods. One issue is that the current runs from foot to foot and therefore is only measuring fat content in the lower body. The Consumer Report study found that the best scales were accurate up to 80 percent of the time. Further, there was no consistency as to whether or not scales reported a higher or lower body fat content. Because of these widespread inaccuracies, "Consumer Reports" no longer tests body-fat scales. Although the scales aren't always accurate, they can still be a tool to measure progress if you test your fat percentage under the same conditions each time. Obesity: Are Normal-Weight Americans Over-Fat? University of California Berkeley Wellness: Body Fat Scales -- Step Right Up? FitDay: Body Fat Scales -- Do They Really Work?